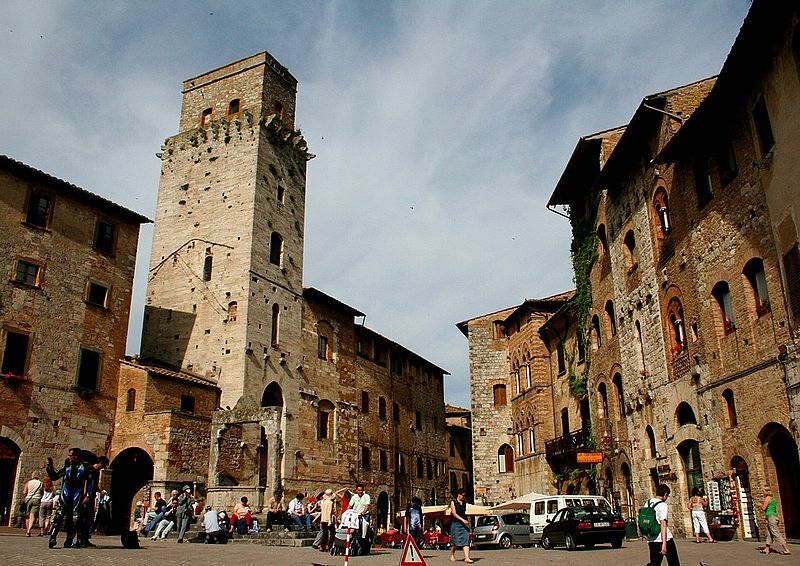 One of the most well-known landmarks in Tuscany is without doubt the beautiful walled medieval town of San Gimignano. Even from far away it is recognisable sitting on the hilltop with its crown of 14 towers, miraculously preserved through wars, catastrophes and urban renewal. 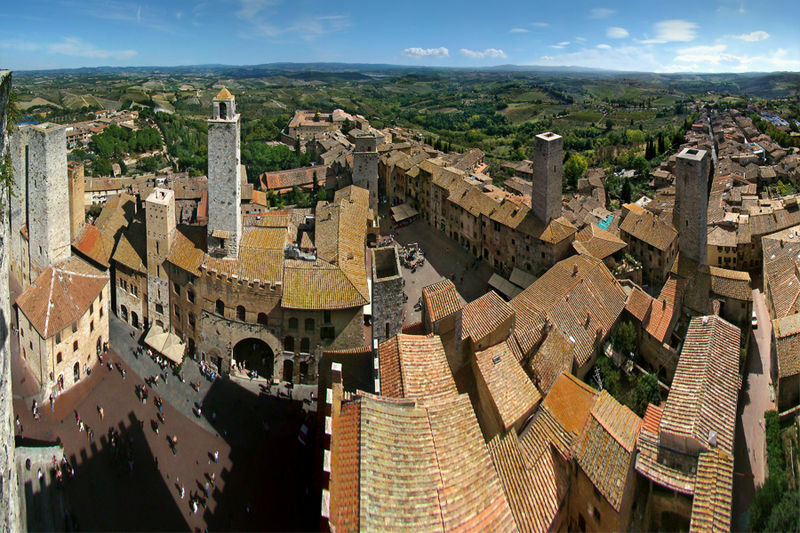 Within the walls the medieval architecture, together with notable examples of both Romanesque and Gothic, is well preserved and for this reason, since 1990, the historic centre of San Gimignano is a UNESCO World Heritage Site. Here one can admire the pointed arches typical of the Siena area. Encircled by three walls, San Gimignano has eight entrances to town, set into the second wall, which date back to the 12th and 13th centuries. The historic centre consists of four squares. Piazza Duomo, on which stands the Collegiate Church, the Palazzo Comunale and the Palazzo Podesta; Piazza della Cisterna, triangular in shape, is the main square of town; Piazza Pecori and Piazza delle Erbe. Settled in the 3rd century BC by the Etruscans, it was during the Middle Ages and the Renaissance era that San Gimignano expanded so as to accommodate the Catholic pilgrims on their way to Rome, as it sits on the medieval Via Francigena. This development also improved other aspects of town life, especially in agriculture and trading thanks to the production of saffron, used both in cooking and dyeing cloth, and wine. 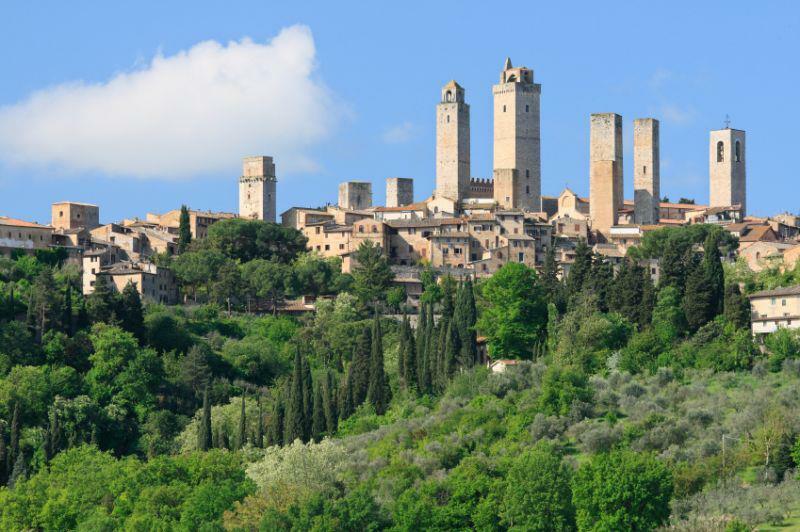 Today the town, in fact, is also renowned for its Vernaccia di San Gimignano, a white wine produced from an ancient variety of Vernaccia grape which is grown on the sandstone hillsides of this area. Said in the Middle Ages to inspire popes and poets, since the Renaissance it has been considered one of Italy’s finest white wines. The first records mentioning the Vernaccia di San Gimignano date back to 1276. 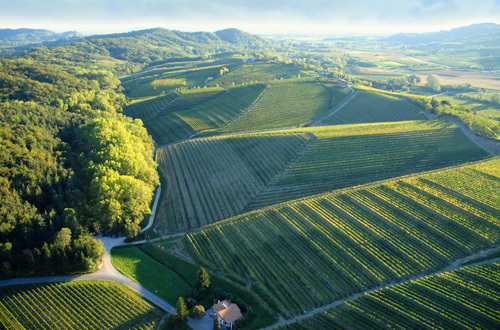 Since then it has been successfully cultivated during the centuries with the exception of a period of crisis in the early 20th century when for 50 years the more prolific Trebbiano and Malvasia grapes were preferred. Today the beautiful Villa della Rocca di Montestaffoli, on the hilltop overlooking the vineyards, houses the Vernaccia di San Gimignano Wine Museum. A tribute to the quality and prestige of this wine. Together with the Vernaccia di San Gimignano DOCG are also produced red wine, San Gimignano Rosso DOC and Chianti Colli Senesi DOCG, and a rosé, San Gimignano Rosato DOC. Obviously there also exists a San Gimignano Vin Santo DOC, the dessert wine par excellence. The territory, however, also produces an excellent olive oil and the already mentioned precious saffron. The cultivation of saffron must be done with much patience and attention. The flowers are picked at dawn, when they are still closed, and have to be desiccated almost immediately. 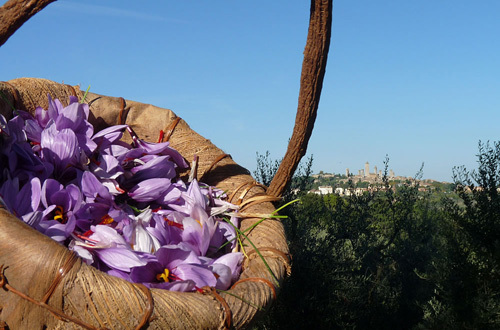 For just one kilo of saffron at least 150.000 flowers have to be picked! The land around San Gimignano is also employed to breed pigs and wild boars which are used for a wide variety of sausages and cold meats. Typically the dry-cured ham Prosciutto Toscano DOP, the cured sausage Salame Toscano, the Finocchiona with fennel seeds, the salami with myrtle known as Mortito and the buristo, similar to black pudding. Obviously being in the Siena area, there are also sheep whose milk produce excellent cheese, such as pecorino or marzolino. Another typical hilltop medieval village in Tuscany with a very generous soul. Questa voce è stata pubblicata in Accommodations in Tuscany, Culture and accommodations in Tuscany, Tuscan food and wine, Tuscan lifestyle, Villas in Tuscany e contrassegnata con accommodations in Tuscany, saffron, San Gimignano, Siena, Tuscan food and wine, Tuscan lifestyle, Tuscany, Vernaccia. Contrassegna il permalink.